This gently spiced chai is positively charming. The cinnamon, clove, and ginger spices are milder than in some chai blends, yet it will still warm and soothe you on even the coldest of days. Pair a slice (or two!) 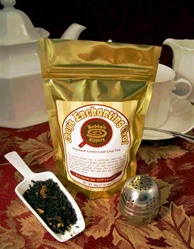 of our savory Walnut Roll with this tea to thoroughly beguile your senses.